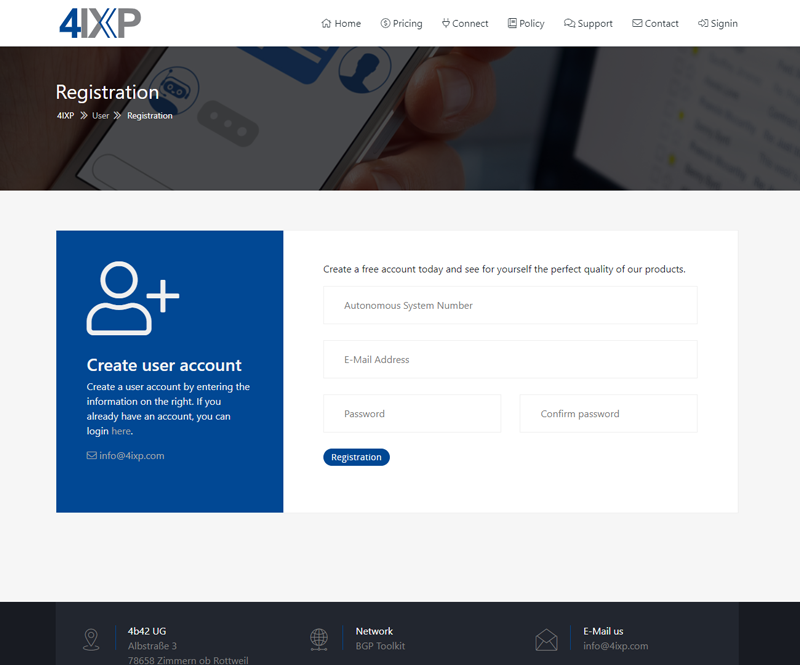 To enjoy the full functionality of the Internet Exchange Point, you need to create a free account. To do this, go to the administration menu or click here. Now complete the fields ASN (Autonomous System Number), e-mail address and password on the right side. Then click sign up to request an e-mail with the confirmation link (If you do not have an ASN, you can request one here). You should receive an e-mail with the confirmation link within a few minutes, if you have not received an e-mail, please check your SPAM folder. 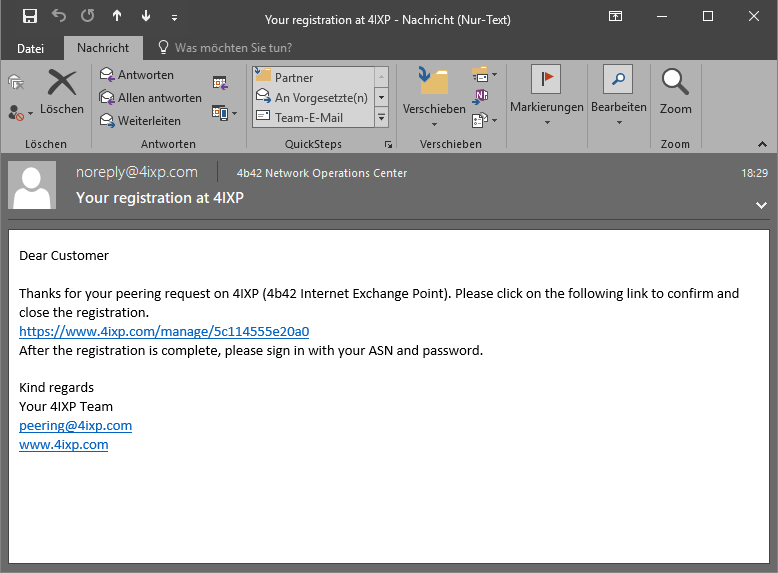 If you can not find an e-mail from us, please send us an e-mail to peering@4ixp.com. Click on the link (or copy it into the address bar of your browser) to confirm the registration and to verify your e-mail address. Afterwards you will receive an e-mail with your access data. Log in with your ASN as user name and password on the left side. After registering, you should complete your details, enter your AS-SET if available, enter your name and website, this information will be displayed and linked to the Peers page. You also have a brief overview of the number of networks, peers and tunnels you have set up. 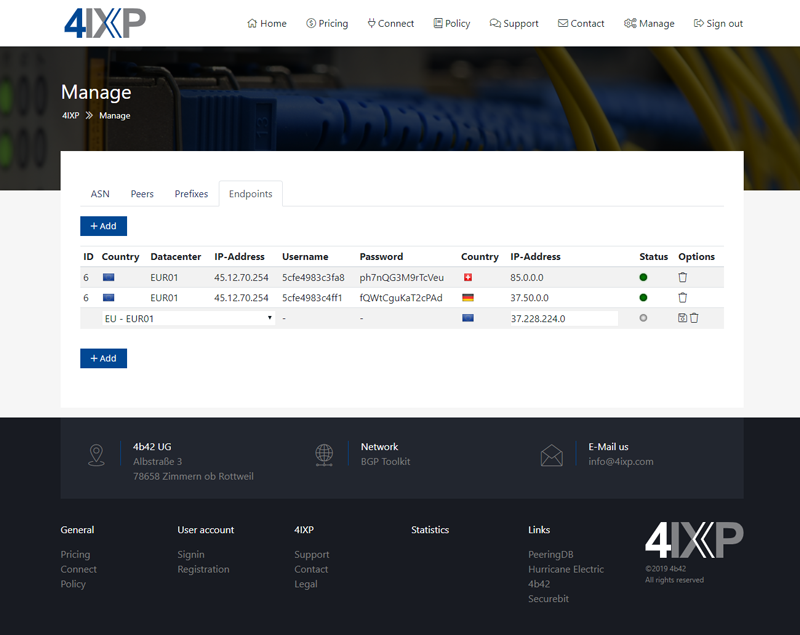 Your Autonomous System Number (ASN) will automatically become a member of our RIPE AS-SET AS-4IXP. If you have specified an AS-SET, this is also entered. Now switch to the menu item Prefixes or click here to manage your Internet Protocol Version 4 and Version 6 networks. Click Add to add a new IPv4 or IPv6 subnet. Enter all the prefixes you want to use at the Internet Exchange Point. These are automatically transferred to our Route Server. After creating your prefix, change to the menu item Peers. 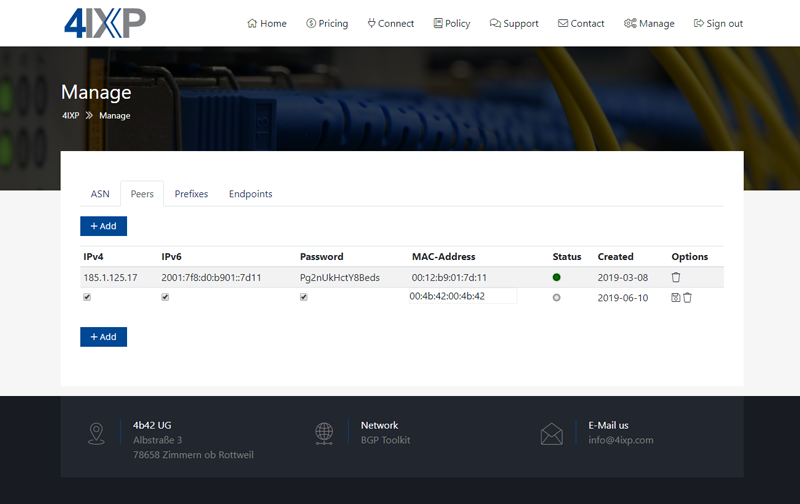 Here you can now add and remove peers, they also have the option to choose whether to enable IPv4 or not, and you can also generate a password for the peer. If you have reached the maximum number of peers, but need more peers, then please write us an email to peering@4ixp.com. There are many different ways to connect to our Internet Exchange Point, the best being via Ethernet, which requires a physical connection via fiber optic or RJ45 cable. 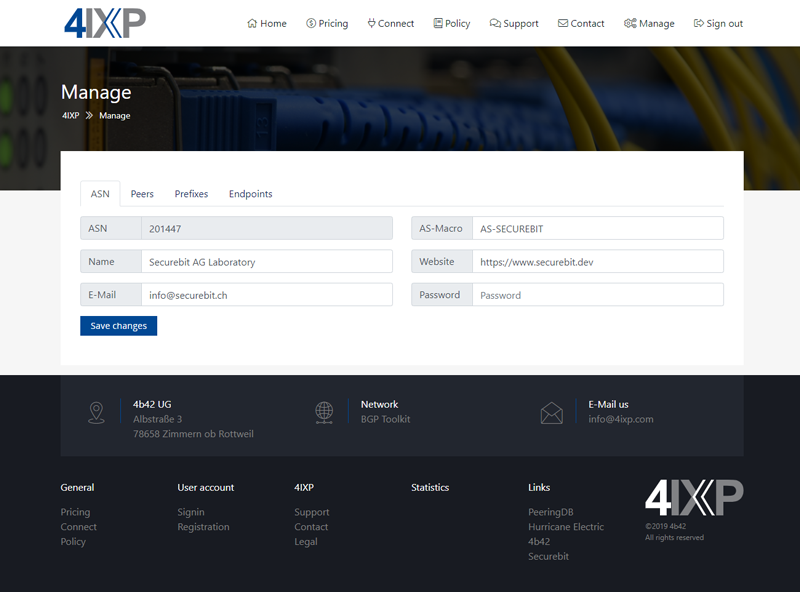 Of course you can also connect to the dedicated and virtual servers of 4b42 with our Internet Exchange Point. Alternatively, you can set up a tunnel via Ethernet over IP or GRE and connect to our IXP via a tunnel. Of course, you can also set up a tunnel to our network with a dynamic IP address. Note, however, that this is not the best solution, since there is a short interruption when changing the IP address. You can update the IP address of your tunnel via the address tunnel.4ixp.net (alternatively you can also use the addresses ipv4.4ixp.net or ipv6.4ixp.net to ensure that the correct protocol version is used).